So you’re looking for a new heavy-duty professional blender. You may be thinking that you need to shell out a lot of dough to get one. When I was looking, I saw that they were almost $600 or more, depending on the brand and type. I don’t know about you, but I think that’s a lot of money to pay for a blender! I wanted one, but just couldn’t justify paying that much money. The good news is that there is now another affordable option. Meet the new KenmorePro Professional Blender. It offers everything you’d expect from a high-powered blender, but at a fraction of the cost. 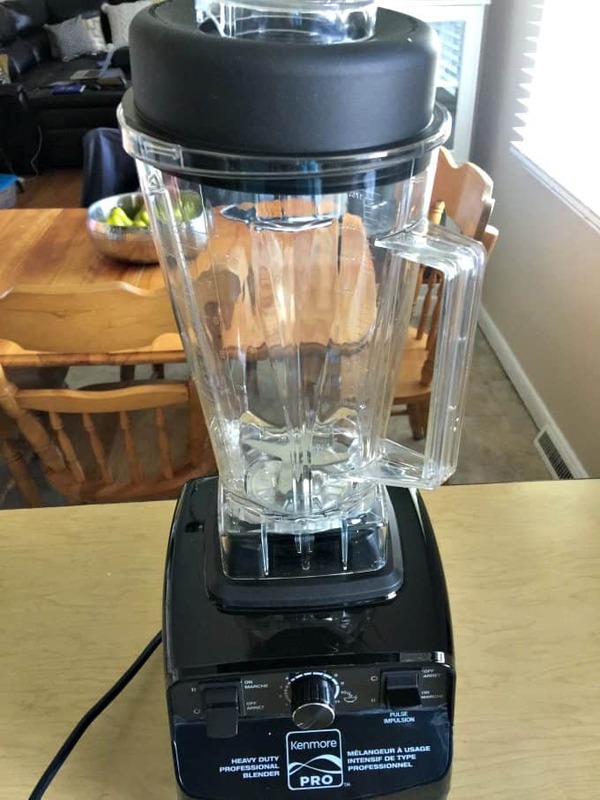 This blender costs $149.97! Yes, I’m totally serious. Sears Canada sent me my own KenmorePro Professional Blender to try out at home. I had a blender, but it was nothing fancy and did not have all the bells & whistles that this one has. I couldn’t wait to test it out with some recipes, particularly pureed soup! Yay for no chunks! First off, this blender is huge compared to my other blender. The jug will hold 2 litres of liquid. That’s great news when you want to make recipes to feed your family. No more blending in batches. It has a 1.95 HP motor and six Japanese-made blades so you can blend, chop, churn, cream and grind to your heart’s content. You can even use it to chop and crush ice. Hello holiday drinks! It has numerous safety features like rubber feet to stabilize, overheat/overcurrent protection so it won’t overheat during use, a soft start motor so it wont suddenly surge with power and a safety switch that disables the motor when the jug is not properly placed. It also comes with a tamper so you can push food or liquid inside while the blender is in use. 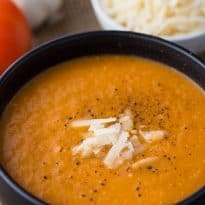 I have a recipe for Roasted Garlic & Tomato Soup that I love to eat, but it’s a pain to make without a good blender. Before, I’d always end up with chunks because my blender would never fully puree all the ingredients. Not so great when you want your soup to be super smooth and creamy. I put the KenmorePro Professional Blender to the test with this recipe. To make it, you need to first roast tomatoes and an entire garlic clove in the oven. They become nice and soft and ready to mix with the other ingredients. I simmered the roasted garlic, tomatoes, onions, chicken broth and spices on the stove for 30 minutes to let the flavours mingle together. Then it was time to get the soup ready to serve using the blender. I poured the entire pot of hot soup into the blender and I had lots of room. I could have easily tripled my recipe and still had room to spare. I turned it on at the lowest setting just to see what would happen and was amazed at how quickly it pureed my soup. It was less than 30 seconds! I poured into our bowls and there was zero chunks. This is how the soup is supposed to taste! Finally, I get it right 100%. Though the soup has no dairy in it, it has a creamy smooth texture. You can taste the sweetness of the roasted garlic in each bite. I garnished with a bit of Parmesan cheese and freshly cracked black pepper. Divine! I’m very happy with the result and can’t wait to try more recipes using my KenmorePro Professional Blender. Now I can make smoothies with kale and spinach without worrying about little green leaf bits getting in my teeth. Purchase your own KenmorePro Professional Blender by Sears Canada for $149.97 in either red or black. It also makes a wonderful holiday gift for a foodie-loving friend or family member. What features do you look for in a blender? 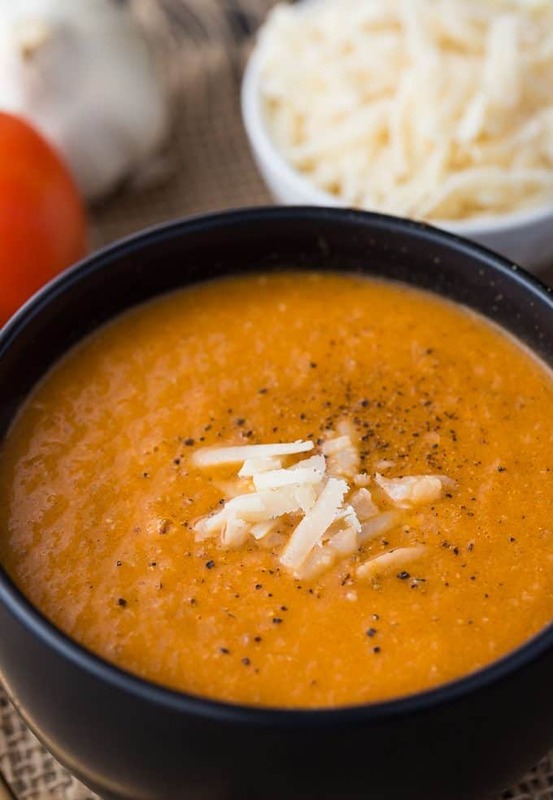 A creamy, smooth soup with a spicy kick! Preheat oven to 400F. Place garlic and tomatoes in a casserole dish. Roast for 45 minutes until garlic is golden and tomatoes are softened. Let cool about 15 minutes and then squeeze garlic into a bowl. Remove skin from tomatoes and add to bowl with the garlic. Set aside. Heat olive in a medium sized pot over medium heat. Add onions and saute for 5 minutes or until softened. Add in 2 cups chicken broth and bring to a boil. Add in garlic, tomatoes, coriander, paprika, thyme and cayenne pepper and turn heat down to low. Simmer for 30 minutes. Pour hot soup into your KenmorePro Professional Blender and puree for about 30 seconds on low speed. Pour into bowls. Top with Parmesan cheese and season with salt and pepper, if desired. Disclosure: This post is sponsored by Sears Canada. All opinions on this blog are my own. My fav feature of this blender is it’s size. A 2L capacity. I love the huge size of it! i love the size and the price of this blender. I really like that the KenmorePro Blender has a 2L Jug Capacity, which is great when making large batches to freeze for later or for the family. I like that it does the same as the more expensive blenders. I love the ice feature! 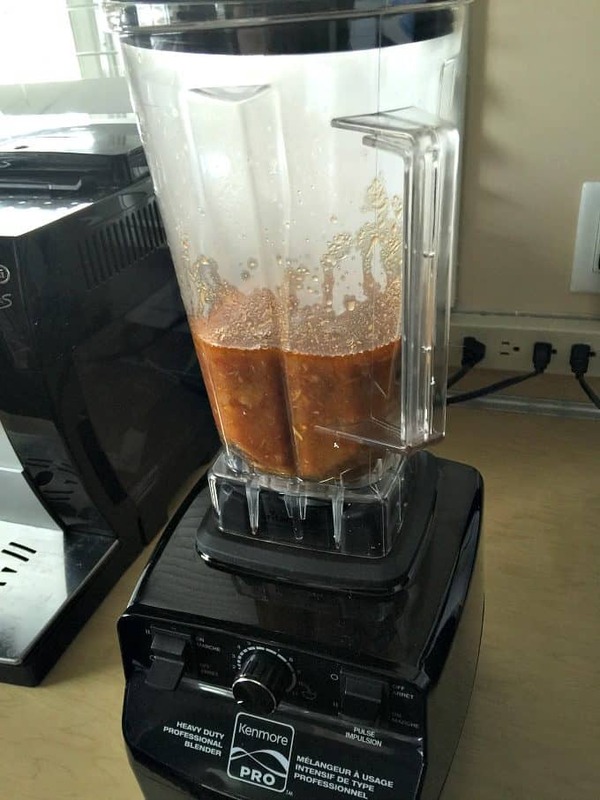 This blender looks awesome. I always look for a blender that has enough power to crush ice, and not leave chunks of food when trying make smooth blends. It makes Smoothies, that all I care about…perfect feature for sure! I like the size of it. It would be great for making soup. Love the safety features – I had a kitchen appliance accident years ago that was quite painful. The safety features on this are great! I love the 2 litre capacity! My favorite feature is that it heats so I can make true homemade soup. Tomato is my favorite and one that I would love to make from scratch. I love the price. It’s just like the high end blenders but it is cost effective! Looking forward to when I can afford one! I love that it blends fast and holds lots of liquid! love the ice feature & how large it is!! I love that it crushes ice. I like the fact that this Kenmore Professional Blender can hold 2 liters of liquid. This means I can make a family batch of anything i want to blend, dice, cream, etc. The power; my current blender cannot crush ice at all! I think the quality for the pricepoint, compared to similar on the market is my favourite feature! 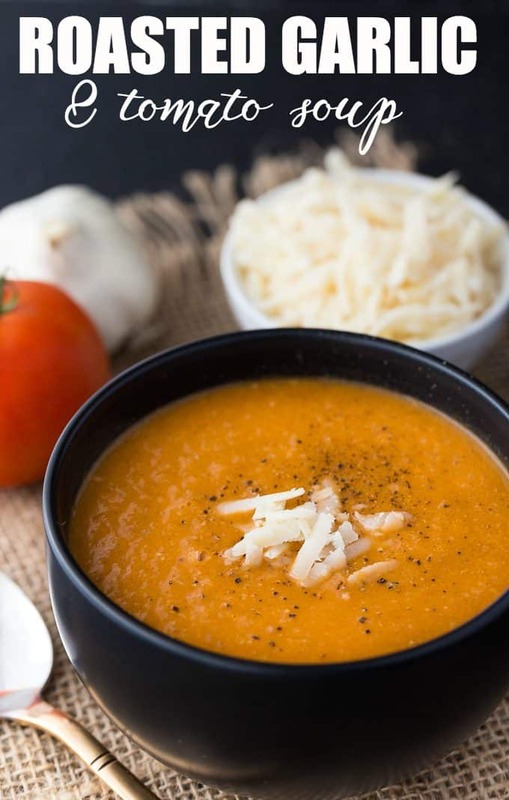 My favourite feature is that the Kenmore PRO Heavy Duty Blender chops, blends, purées, and even heats for cozy fall soups in a flash. My favourite feature is the 1.95 HP motor. The powerful motor will come in handy for making a lot of dishes! The fact that it crushes ice. I love that it has 11 speeds! I love the fact that it is powerful and comes with a tamper. Perfect for making all kinds of things. 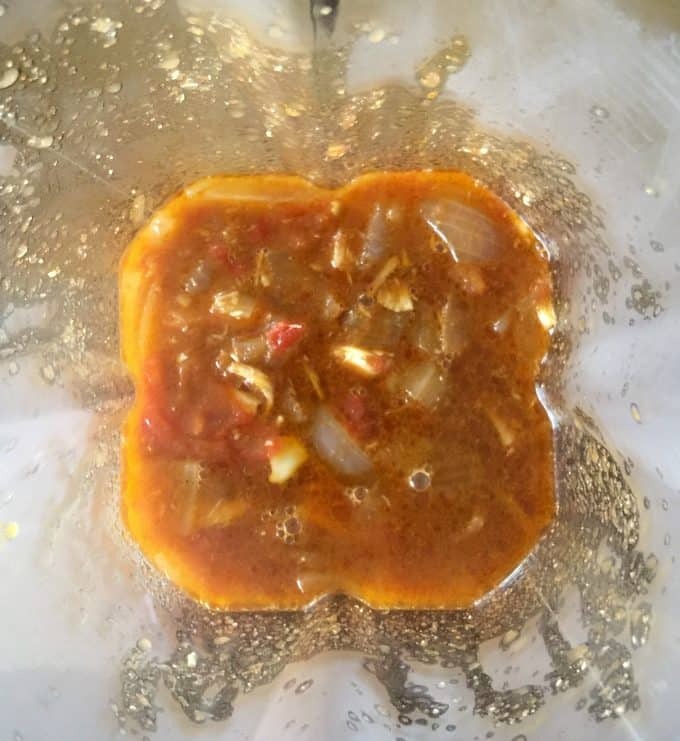 Thanks for posting a review, Very helpful and the recipe looks delicious!! Thanks to for the chance to win! I like the capacity and that it can hold 2 L ! Thats a great feature ! Thank you for the chance to be entered in this giveaway ! My favourite feature is that it can chop and crush ice. That would be great for making thick smoothies or nice cream.